Zaha Hadid designed Sleuk Institute building Rith Institute for Research on the Cambodian massacres Archi-new - Free Dwg file Blocks Cad autocad architecture. Archi-new 3D Dwg - Free Dwg file Blocks Cad autocad architecture. Zaha Hadid unveiled architectural designs for the building of the new Cambodian Institute Sleuk Rith Institute Author of five wooden towers plaited will include the largest archive of documents related to the mass killings that took place in Southeast Asia. Architecture has chosen well-known contemporary designs and the use of modern materials such as cement, fiber glass and resin; wood material for the adoption of such construction cone rules the five towers, which will constitute the building, which envisioned an activist in the field of human rights Yuk Chang Youk Chhang to equip himself his position in the Cambodian capital Phnom Penh Phnom Penh featuring Documentation Centre Archive Cambodian Documentation Centre of Cambodia, a non-profit organization registered crimes occurring during the Khmer Rouge in the seventies and known as "the Cambodian holocaust." 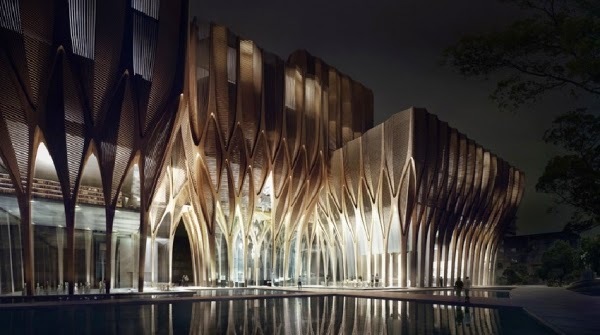 Zheng, who have suffered political imprisonment in the age of fifteen he was and is now executive director of the Foundation choosing Zaha Hadid to design a new building, which he hopes to secure design departure from the typical approach to architecture anniversary. "We wanted to create the Institute looks forward away from Mataatbnah Mazmrnmazj buildings memory of wars and massacres of the adoption of the CRP, semi-industrial and shapes, and the representation of cruelty. Best shrines and buildings Memorial is not just things we visit once to reflect on and moving away, but the best is that incite thought and Remembrance and also public places kinetic and life involved with all generations in the community. "In the words of Cheng. The building consists of five towers ranging between three and eight floors and includes a museum, library and archive school graduates focused on massacres and conflict studies and human rights as well as the Center for Media Research Center and Hall of celebration can be used by the local community. Iron design featuring geometric shapes inspired by the Temple of Angkor Wa and other attractions Cambodian creator "complex Fragaa complex" of external and internal cross-blanks based on the internal vacuum major. Iron has stated, "We hope to have Celeok heir Institute and garden memorial effect real transformative brings new life and future eastward to the site which carries traces of the great tragedies of the past. Place hello where thinking and interaction and communication is not just an expression of my free but also embodied in the Charter of the people of Cambodia . " The building is located on the former land of the Boeung Trabek Secondary School which was used as a camp re-education during the reign of Khmer Rouge as the building will rise on the reflective protected from seasonal floods basins.